“Separating different versions of elements—isotopes—is an excruciatingly difficult task: They differ by just one or two extra neutrons, an infinitesimal difference in mass. But University of Chicago researchers announced Oct. 23 that they’ve added an entirely new way to do so. In a paper published in Physical Review Letters, a team led by Prof. Steven J. Sibener describes a way to separate isotopes of neon using a beam of gas aimed at a precisely patterned silicon wafer, which reflects the different isotopes at slightly different angles. The method could one day be a less costly and more energy-efficient way to separate isotopes for medicine, electronics and other applications. The few neutrons’ difference in an isotope can make a world of difference to its usefulness. Today, the most common isotopes of interest are uranium for nuclear energy and a constellation of radioisotopes for medical treatments, but enrichment is also increasingly of interest in the electronics world. In particular, isotopically pure silicon makes much more efficient transistors for chips, and holds significant promise for quantum computing. But the difficulty in the task—current commercial methods generally involve lasers or bombarding an element with electrons until it ionizes, and often multiple repeated rounds to get the numbers higher—has limited its common use. Sibener’s team instead started with a supersonic beam of neon, in which all atoms have been accelerated to the same high speed. 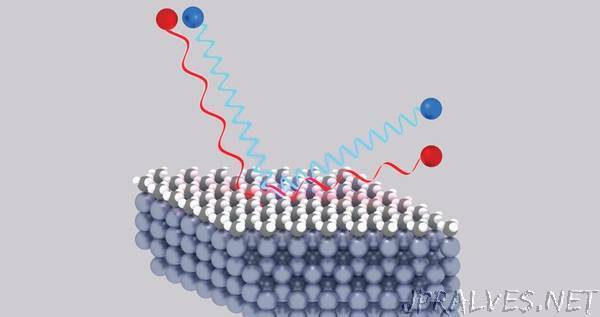 The beam slams into a crystalline surface whose atoms are arranged in just the right lattice formation so that incoming atoms are flung off at slightly different angles depending on their isotopic composition. “One can think about it like separating the various colors of light into a rainbow using a prism,” said Sibener, the Carl William Eisendrath Distinguished Service Professor of Chemistry and the James Franck Institute. The method could be used for lighter elements on the periodic table, up to about atomic mass 40, as well as small molecules, said graduate student Kevin Nihill and postdoctoral scholar Jacob Graham, co-first authors on the paper. They also noted that the isotopes bounce off the surface at slightly different velocities, which suggests the method could be augmented to yield higher levels of enrichment and purification using velocity separation.